The claim that Nigeria is now self-sufficient in rice production is fallacious and deceitful, the Africa Rice Centre (AfricaRice), Ibadan, Oyo State, has said. AfricaRice is one of the 15 research centres of the Consultative Group on International Agricultural Research (CGIAR), a global research partnership for a food secure future dedicated to reduction of poverty, enhancement of food and nutrition security, and improvement of natural resources, financed by international governmental and non-governmental donors around the world. Dr Francis Nwilene, the Regional Coordinator of AfricaRice Centre, told The Guardian that though the Anchor Borrowers' scheme, especially on rice production, had been helpful in boosting the quantity of paddies produced in the country in the last few years, Nigeria is not self-sufficient in rice production now. He said: "My brother, it is a big issue and I don't want to go into that. I was quoted to have said we are self-sufficient at 4.0 million tonnes by OCP, a fertiliser group owned by the King of Morocco, but how could I say that when I know well that we need 7.8 million metric tonnes to be self-sufficient and currently we produce about 6.8 million tonnes. "So, there is a deficit of at least one million tonnes of rice per annum. Reporters have been coming here for interviews but I refer them to our head office. I don't want to get myself involved in the controversial issue." President of the All Farmers Association of Nigeria, Ibrahim Kabir, confirmed that the country is not yet producing enough rice to meet up with the home demand by telling The Guardian in a text message that "Nigeria has made giant strides in this regard but we need to do more to attain self-sufficiency." By deduction from his statement, Kabir admitted that though Nigeria had increased rice production, it had not attained self-sufficiency, and would have to invest more in irrigation facilities for dry season farming; supply more improved varieties of rice seeds; rev up local blending of fertiliser and encourage farm mechanisation by making tractor hiring services available at the doorsteps of farmers at reasonable rates. Sahabi Augie, chairman of the Rice Farmers Association in Kebbi State, said last year, farmers harvested 1.1 million tonnes of rice, while 1.5 million tonnes are expected this year. He too expressed that Nigeria could do more annually until it produces more than annual consumption figures, saying this would discourage smuggling and make the price of locally produced brands of rice more affordable. Dr Nwilene said rice is a huge business globally, and smuggling cabals in Nigeria do not want to let go of the illegal trade. He disclosed smugglers do re-bag foreign rice at the border towns as local brands of rice to deceive the law enforcement agents and Nigerian consumers. It has been reported that in Katsina State, smuggling of rice is one of the thriving illegal trades the majority of the people living along the Nigeria-Niger borders live on. At the Seme border, rice is smuggled daily from the Republic of Benin into Badagry, Lagos State, and eventually into Lagos and other parts of the country either by regular rice dealers or car smugglers using the opportunity to smuggle the product as additional means of illegal income. Small-scale smugglers use motorcycles, buses, canoes and cars to convey rice across the borders in Katsina, Oyo, Lagos, Ogun, Kwara and other states flanking neighbouring countries. Sometimes, it was reported, the trailers from Benin Republic convey rice to Hirji, a border village in Katsina, to off-load, and from there youths are engaged to transport to Magama in Jibia, with a bag of rice selling between N9,000 to N11,000 at Hirji, far below the selling price of locally produced and processed brands of rice. 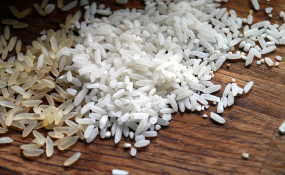 Three factors, the rice centre boss said, are responsible for high rate of smuggling, and they are porous nature of the borders; high average cost of locally produced rice due to low productivity per hectare and grossly inadequate power supply to processors, and unbridled taste for foreign goods of many Nigerians. Nwilene recommended that the Nigerian Custom Service should be more proactive and shun compromise; Nigerian farmers should be more empowered with high-yielding varieties of rice seeds developed by the centre, trained on new production techniques and agronomical practices; and that Nigerians should reject foreign rice, as well as doing all necessary investments to generate and distribute adequate and cheaper electricity. If nobody buys foreign rice, smugglers will lose their jobs, he argued, because nobody sells what nobody else buys. He revealed to The Guardian that Egypt, as a result of rice farm destruction by floods, had charged scientists in the country to develop upland varieties of rice that could yield up to 10 tonnes per hectare, in the next three to four years. The country currently cultivates low-land varieties of rice which require waterlogged areas, exposing such farms to flooding. Upland varieties of rice are cultivated on drain farmland like maize, cassava and other crops which flourish with rainfalls.